What is E-design? 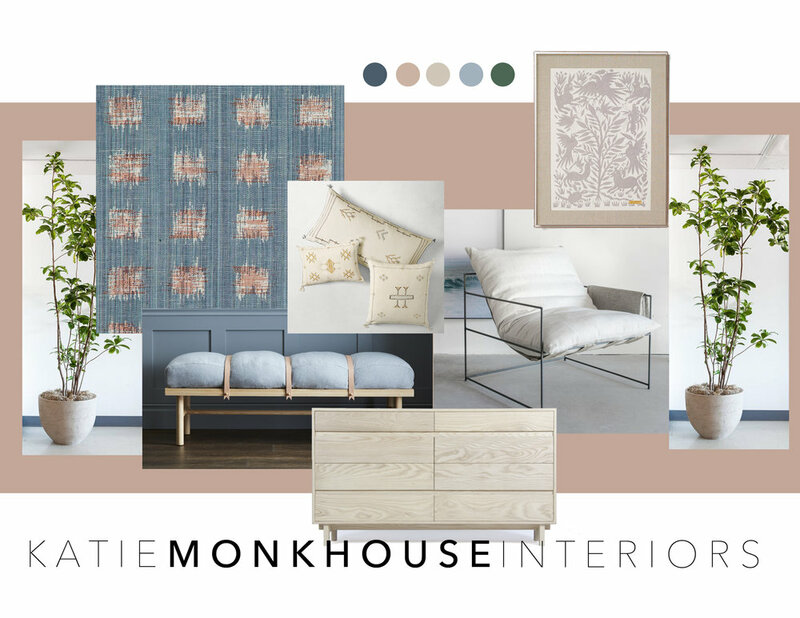 And how we plan to do it around here... — Katie Monkhouse Interior Design - Harrogate, U.K.
E-design seems to be a bit of a buzz word these days. No doubt fueled by everyone’s desire for an ‘instaworthy’ home without the price tag of hiring a designer. I have been wrestling with whether or not to offer this service for a while now and while I am slowly taking on some remote projects, I am trying to figure out how I want this service to look and feel. A large part of what I offer as a designer is an experience. I take the heavy lifting off my clients and work really hard to make sure this process is not only easy but actually enjoyable. My clients in California were always super busy families with demanding jobs but a desire to live in a beautiful home. They had the means and the style but none of the time. I dealt with all the ugly stuff behind the scenes (damaged deliveries, delayed shipments, stubborn contractors, coordinating trades) and delivered a beautiful and complete space. Of course there are always issues that the client needs to be involved in but I alway try my best to minimize the stress and present possible resolutions alongside the problem. E-design takes so much of that experience away because e-design is a team sport, we are doing this together. And for some people, that works just fine.. The client needs to do their own measuring, take their own photos, create Pinterest boards, take on some or all of the ordering, manage the deliveries, and place and style the product. Not to mention I don’t even get to experience the final product, which is half the fun for me. And I live for install days which obviously don’t happen with e-design! Selfish, I know, but that is something that holds me back when wanting to dive in! I swear I’m not a control freak, I just like to make sure everything is, well, perfect. I am working on pulling together a process that will be much more bespoke than the online-only e-design companies like Havenly or Decorist. I firmly believe there is a place for that kind of service but that’s not what I’m about. If you want to work with me remotely, it will won’t be a cookie-cutter, one-design-fits-all approach. It will take time, no 48 hour turn around offered here! It won’t be the least expensive option on the market but in the end you will have a thoughtful, cohesive, considered space that you won’t want to re-do every spring! My process starts with sketching out rough floor plans (that you will never see) and building a digital floor plan based on your photos and measurements. I play with the size, scale, and placement of furnishings until I feel that we have a achieved the best layout. The pieces in the floor plan won’t necessarily reflect the style of the furnishings we will ultimately pick but I send this to you to make sure you feel this layout works for you along with your mood board. Based on our conversations and any inspiration photos you send me I pull together a mood board or rough mock up of what I am envisioning for your space. This is one of the first things you receive along with your floor plan. Once we know the layout of the furniture and you have approved the mood board, I move on to sourcing pieces to fit our model. I source from retail and trade-only vendors. I don’t believe in getting everything from big box stores - I feel your space deserves unique and thoughtful pieces. I mock up elevations with the furnishings and accessories for you to get an idea of how it will come together. I put together a proposal with the cost of all items in the design and this proposal along with the mockups will be the next deliverable you receive. If we are doing window treatments, paint, or custom furnishings - you will also receive a package with samples for you to see and touch. Once you receive the design and budget you can send me your feedback for the revision phase if it’s needed. I will pull together some alternatives, adjust the mockups, and resend for approval - we then can make final decisions. Depending on the vendor, I will either send you a list of links for you to purchase on your own (these will be affiliate links where available) or I will invoice you for anything being purchase from my trade sources. Items from trade sources may need to be shipped to a local receiving warehouse before being delivered to your home. If you prefer to have all items shipped to receiver and delivered all at once (this is how we do it in a traditional design), this can have that arranged. Your floor plan will act as a roadmap for placement. I’ll give you notes like ‘sofa should float 10” off back wall’ or ‘art hung no more than 18” above table’ where needed. As far as styling, this is the part that I love the most and the reason why e-design is hard for me! - I will give you a few photo examples of how to style your accessories and will happily jump on a video call if more assistance is needed. I hope this gives you an idea of how much time, effort, and love goes into the process on my end. I wish I could boil it down to something quick, easy, and cheap but that’s just not how I work - and honestly, I believe your home is so important and churning out half-hearted designs wouldn’t suit either of us in the long run. This service starts at $1,500 / ₤1,000 for a single room and has a turn around time of approximately 4 weeks for the design. Procurement and installation obviously depend on the lead time of the product we select! Feel free to ask questions in the comments below or drop me a line at katie@katiemonkhouse.com. And if you are just ready to jump in, go ahead and fill out the E-Design Intake Form!